USA has many symbols, and probably the most recognizable of them is the Statue of Liberty. 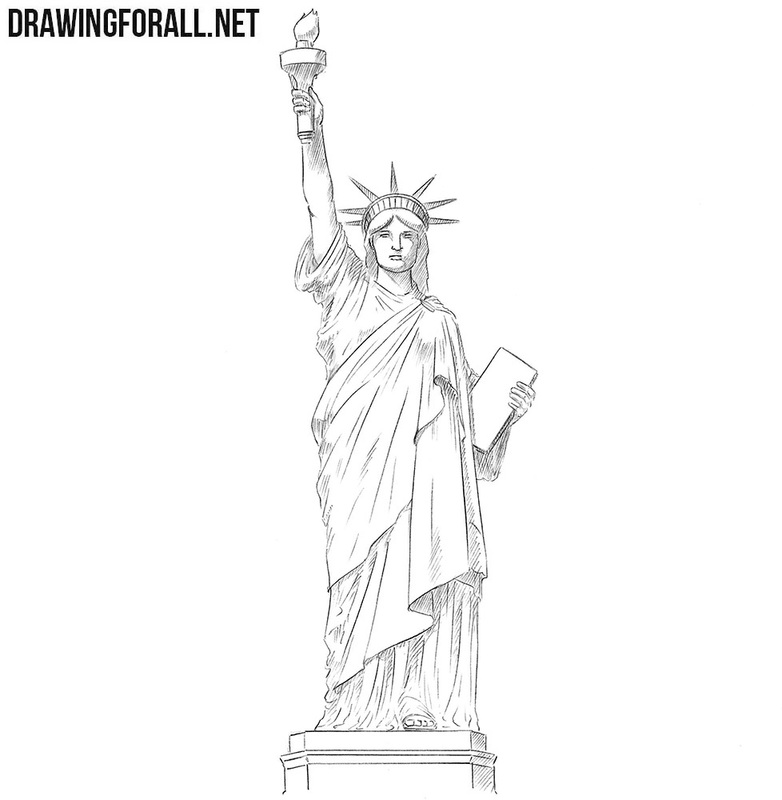 This statue, standing on the island of freedom in New York, is one of the most popular statues in the world. The Statue of Liberty is the embodiment not only of America, but of freedom and democracy. And today we are going to show you how to draw the Statue of Liberty. 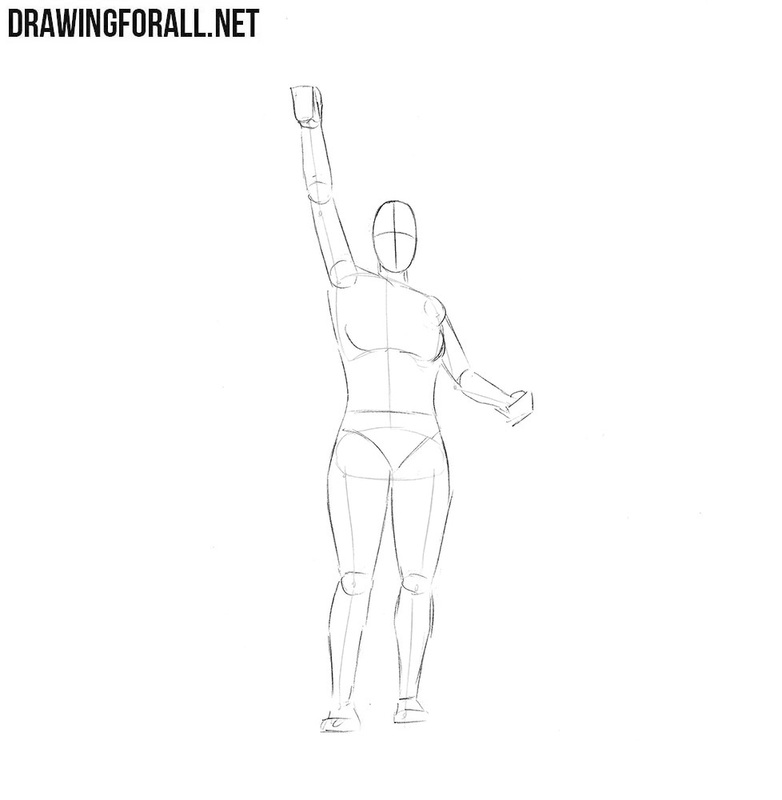 Despite the fact that this is not a real human, but a statue, we will apply the principles of drawing a real person. First of all, sketch out the head in the form of an oval. Next, draw a long line of the spine. On this line, we sketch out the chest and pelvis. 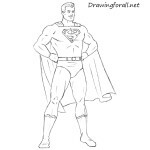 Then sketch the arms and legs with simple lines. Do not forget that all these lines should be made as light as possible. 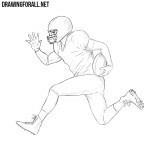 All second steps of our drawing lessons are devoted to the fact that we add volume to the drawing, and this lesson is no exception. First sketch out the intersecting lines on the face. Next, outline the neck and torso, which narrows around the waist. 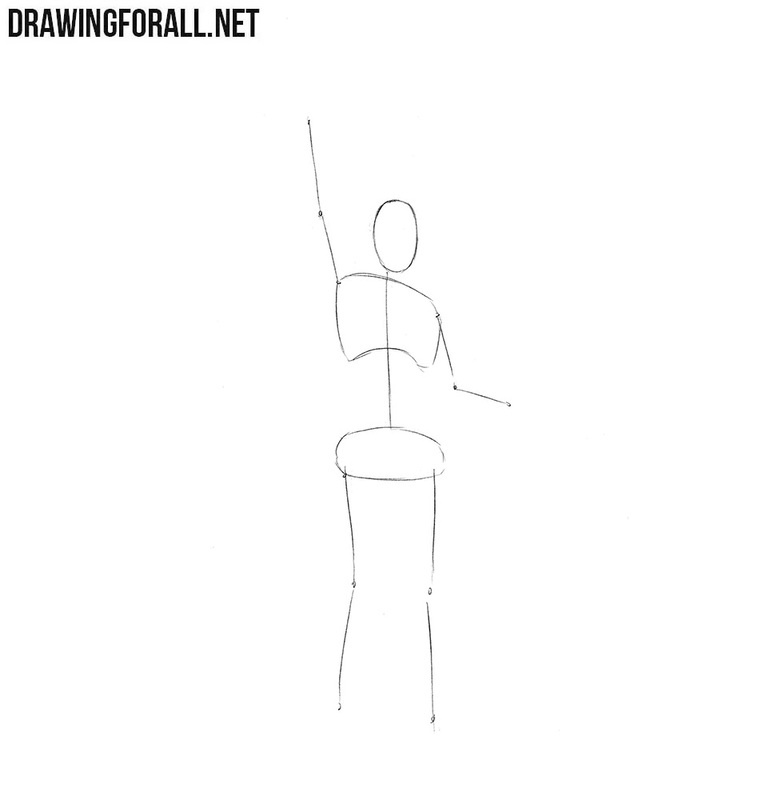 With the help of simple lines, we sketch out the arms and legs. Please note that here we have applied the standard principles of drawing a female figure. Now let’s add the most basic details to our drawing. First of all, outline the details of the face with the help of intersecting lines from the previous step. Next, sketch out the outline of the crown and hair. With the help of long lines sketch out the outlines of the long dress. In one hand sketch out the torch and in another hand sketch the tablet. Sketch out the pedestal under the feet. So, starting with this step, we will begin to draw the final details. And by tradition we’ll start drawing from above. Using clear and dark lines, carefully draw out the outlines of the crown, hair and details of the face. Note that the facial features on the Statue of Liberty should look like the outlines of faces of ancient Greek statues. 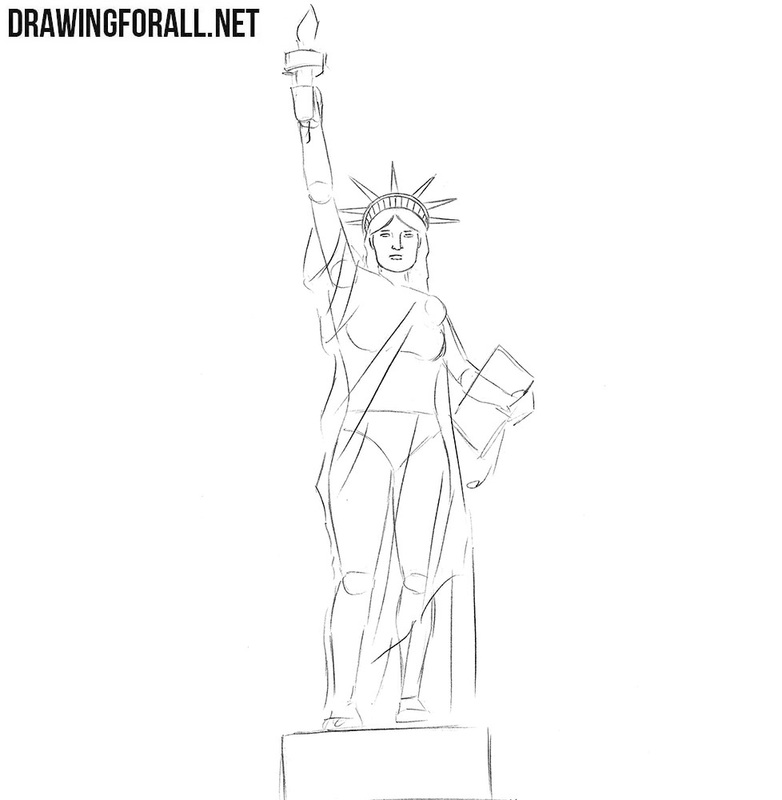 Now let’s start drawing the details of the clothes of Statue of Liberty. 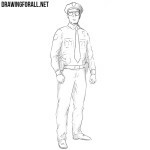 Using long lines, carefully draw out the top layer of clothing, as shown in our example. Try to repeat all the lines and folds in order to make clothes look the most realistic. In this step, we will continue to draw clothes. As you can see, here we will draw the lower layer of clothing. Note, that there are a lot more folds on this layer than in the previous one. In the same step, we need to draw a visible foot of the Statue of Liberty. So let’s get to the arms of the Statue of Liberty. Using clear and dark lines, carefully draw out them, taking into account all the curves, as shown in our example below. At the same step carefully draw out the base below the Statue, torch and tablets in hands. 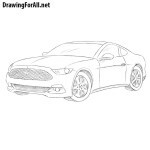 Don’t forget to erase all the unnecessary guidelines from the drawing. 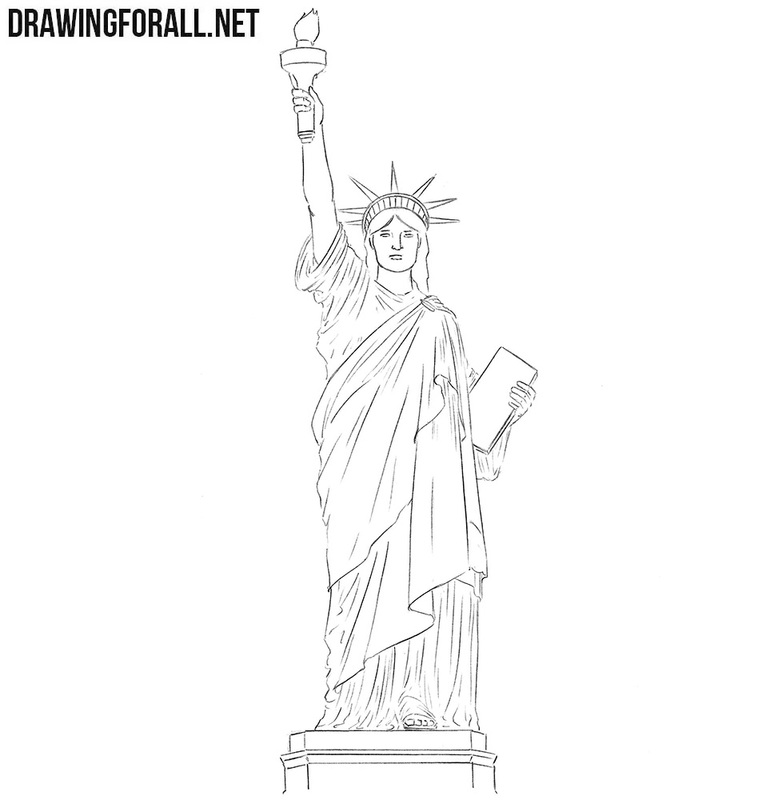 The drawing of Statue of Liberty is almost complete, but in order to give it a final look, we will need to draw shadows. 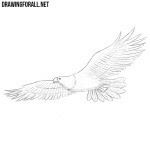 We will do this with the help of classical hatching. As already mentioned many times, first we need to determine the light source, and then put the shadows in the least lit areas of the drawing. So, the drawing tutorial about how to draw the Statue of Liberty has come to an end. 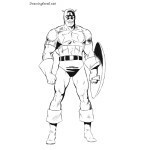 This statue for many people was a symbol of achieving a dream, and we hope that its presence on DrawingForAll will be a sign of achieving the american dream for each of us, authors and readers of our site..